Porch & Patio of Frederick | Your favorite porch, deck, and patio builder in Frederick, Maryland. Are you looking to build a new deck or patio? How about expand on an existing project? Porch & Patio of Frederick is dedicated to creating beautiful outdoor living spaces by tastefully designing and constructing custom porches, decks, patios, hardscapes, and sunrooms. Give us a call today and you’ll find out why we’re one of the best in Frederick. Proud partners with CHF Deck Company! With so many options in the Frederick Maryland area, such as The Deck Heads, Decks of Maryland, and Trademark Deck & Patio, we’re proud to be the option so many of our past customers refer. Our mission is to turn our clients’ ideas, dreams, and visions into a quality structure to enjoy for years to come. Clients of Porch & Patio of Frederick rest easy knowing that during each stage of their project, work is performed to the highest quality and standards. Our team of builders and craftsmen are licensed, bonded, and insured, as well as up to date on the latest trends, materials, products, designs, and building codes. What are you looking for us to build? Are you not sure, what you’re looking for but need some inspiration? Here’s a list of typical decks you may find in the region. 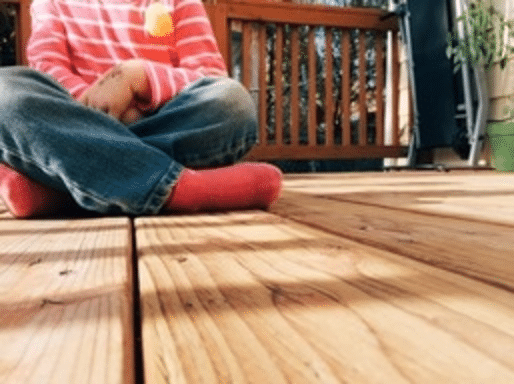 Are you thinking about that perfect deck but don’t know how much to budget? 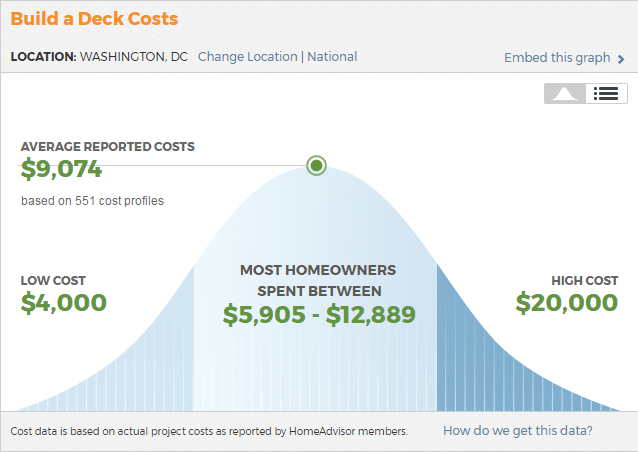 Here’s a True Cost Guide from Home Advisor. Call us anytime for a more detailed estimation. Have you already picked out the perfect type of deck in your vision? What type of materials do you want to use? Composites – Extremely weather resistant, made from wood fibers and recycled plastics. Won’t splinter, warp, rot, or split. Trex, TimberTech, CorrectDeck, and Veranda are but a few composite manufacturers we work with. Here is a great article on decking materials from Popular Mechanics: Click Here. Don’t settle for a run of the mill Lowes deck builder or a Home Depot deck builder, go with an affordable deck builder that stands behind their own name and reputation. Regardless if its a simple deck, a deck patio builder combo, or even if you have a flat lot or a steep drop behind your home, we have the know-how to get the job done and build a beautiful deck that will be both elegant and functional at a reasonable cost. 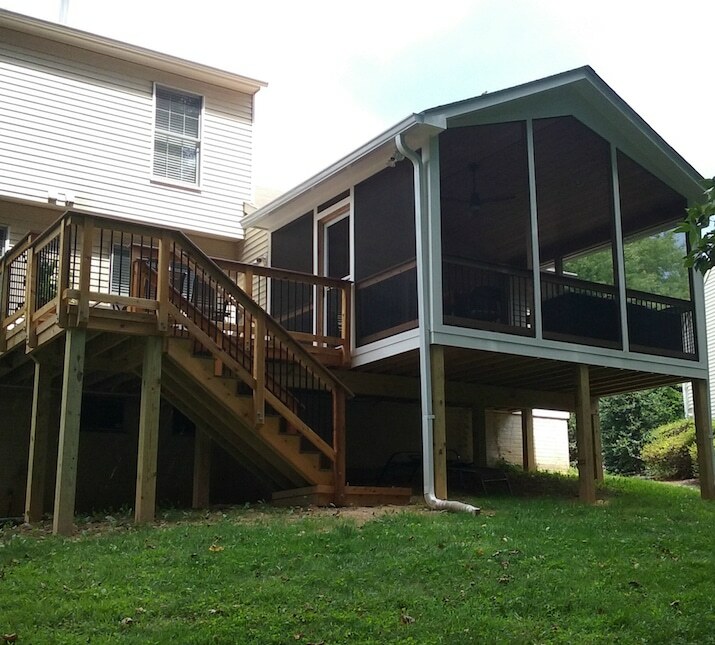 ​Regardless of the function, when you search; deck builder Frederick MD, look no further. 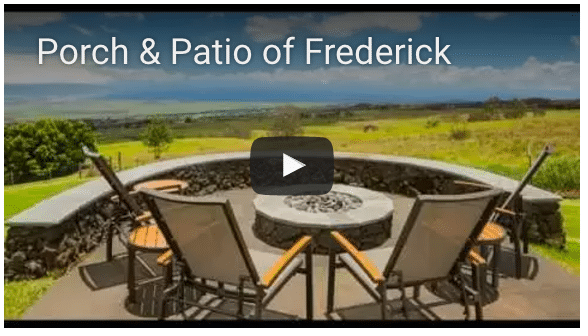 Porch & Patio of Frederick is ready to build your unique and beautiful outdoor living space. 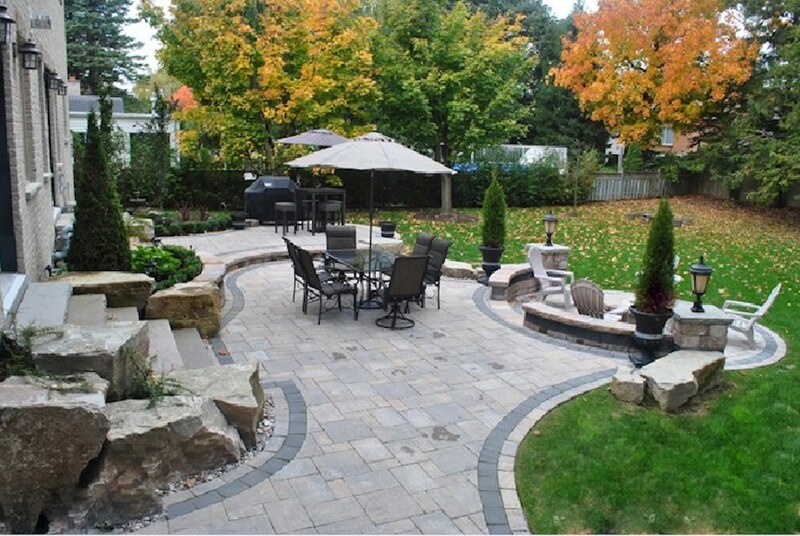 We are your patio home construction and hardscape construction experts! In addition to your patio, adding a custom hardscape or wood feature, such as a fire pit, pathway, raised bed, pergola, or gazebo, can complement your existing structure, while providing natural flow into your landscape. If you’re worried about costs, concrete patios can be a lower cost solution. ​Read more about patio construction materials, at HGTV.com. Stamped concrete can be a beautiful alternative with many patterns to choose from.​ Give us a call to discuss options and we’ll find the perfect materials for your patio. Porch & Patio of Frederick is your premiere Maryland patio pavers and concrete patio contractors. 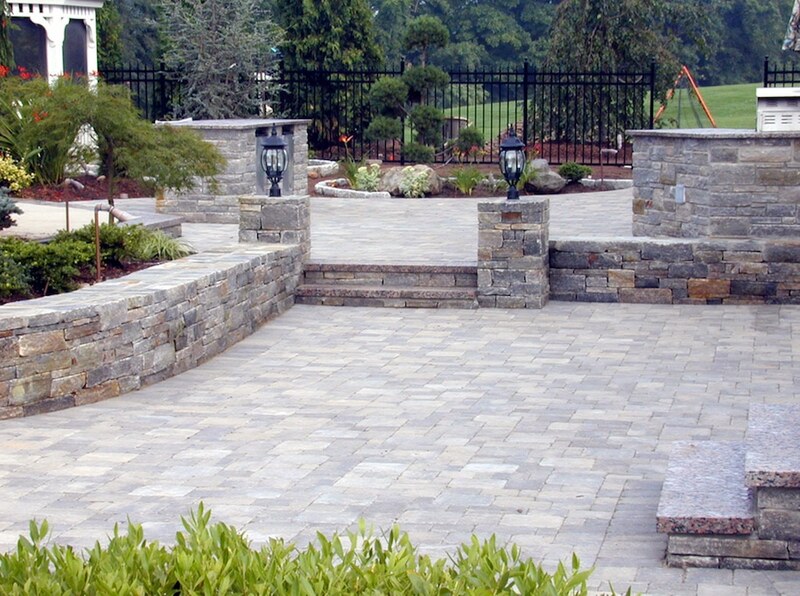 We’re your first choice when looking for local patio builders Frederick MD. Give us a call today and lets see what we can do for you. For those who don’t live on the flattest of lots, a multi-level patio can provide unique climates for each level. A client can enjoy a main level for larger gatherings, another level for the grill and your outdoor dining table, and a level with the fire pit for when you want to get cozy around a warm fire during the cooler months. When landscaped properly, your outdoor patio can provide an inviting flow into separate functioning regions of your outdoor living space. When you’re performing your patio builder Frederick search, remember that we’re the best in the area and are happy to sit down with you to discuss your vision. Adding stone features like walls and walking paths, flower beds, water features, raised bed, or larger scale fireplaces makes each build unique and beautiful. If you’re really one with the outdoors, an outdoor kitchen is a beautiful addition when hosting guests. Just be warned that the more complicated the build, you may find yourself with higher maintenance costs than expected. Multi-level patios can be tricky as there’s a few builds we’ve seen that the attempt didn’t necessarily provide a cohesive and flowing result. The last thing you want is to complete a patio that has everything on your checklist but sacrifices that inviting and warm feel. We at Porch & Patio of Frederick recommend you shop around to find a builder you’re comfortable with for both their design and level of competency. Above all else, ask a lot of questions to ensure you are comfortable up-front before choosing your paving contractors. Porch & Patio of Frederick is your home porch construction and home deck construction experts. Do you need to replace your existing porch? Although porch replacement can be extremely difficult, we’ll work with you to layout expectations and get you on a clear path to replace your existing porch. ​Are you interested in a new open porch, portico, farmer’s porch, screened porch, or even a three season porch? If you’re in need of a porch contractor for your home, Porch & Patio of Frederick is an expert porch builder! Regardless of which type of porch you envision for your future build, we at Porch & Patio of Frederick are ready and standing by to make your dream a reality. We’re your porch builder Frederick MD and porch replacement contractor experts. Give us a call today and let’s see what we can do for you. Are you looking for a getaway to the outdoors that provides the beautiful views of nature while protecting you from undesirable temperatures? Whether it’s the middle of summer or a snow covered winter, there’s nothing like curling up with family in a beautiful sunroom. 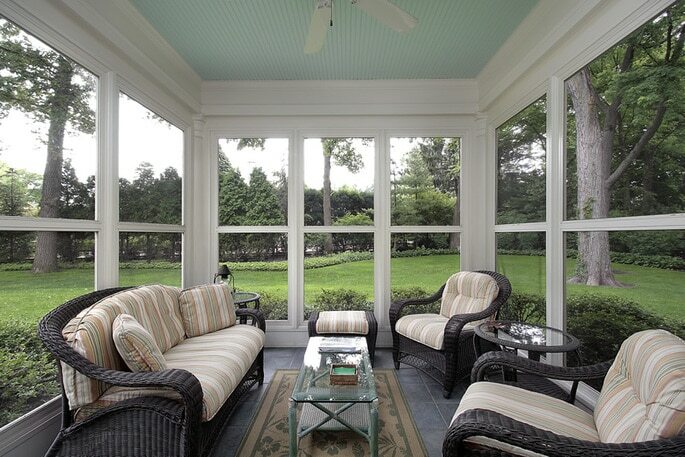 Are you interested in a screened in porch? We can help you there as well! It doesn’t matter if it’s a screened in porch, three season room, or even a sunroom. We’re your right choice, at the right price. We know our stuff and our staff has been in the business for over 20 years. 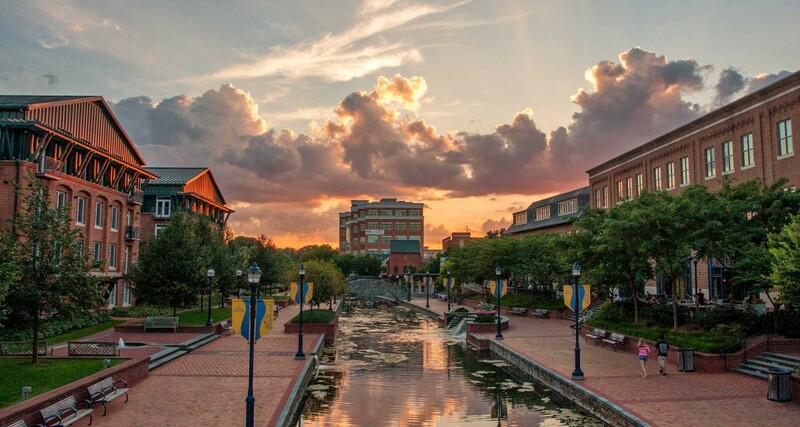 If you’re looking for an awesome place to start a business, Frederick and it’s surrounding towns are some of the best places to live in Maryland. Frederick County has a population estimate of 247,591 (Census.gov), median household income of $64,700 (niche.com), and Urbana is ranked 8th Best Places to Live in Maryland and 115 Best Places to Live in America (niche.com). With amazing weekly activities for you and your family in Frederick, there is always something for everyone! Our Historic Downtown Frederick, National Museum of Civil War Medicine, Weinberg Center for the Arts, and Flying Dog Brewery are but a small few of the many attractions we have! If you’re looking to start a business, the Frederick Chamber of Commerce, the first chartered Chamber of Commerce in the United States, is extremely active within the community and the Office of Economic Development is light-years ahead of other counties of this size! These are but a few reasons why we love it here and are proud to be a member of this amazing community! When picking the type of porch, deck, patio, or sunroom you’re searching for, we highly recommend that customers take the time to do their own third party research while searching through deck contractors in Maryland. Regardless of which company you choose to build your dream porch; understanding the material types, foundations, and building process highly reduces your stress and give you peace of mind that your builder is doing the right thing and you’re paying the right price for the product. When you’re ready to make your outdoor dream a reality, Porch & Patio of Frederick is here to answer all of your question and help provide the most elegant and beautiful product that meets your budget. We’re proud to be one of the best Maryland patio contractors, Maryland deck contractors, and Maryland porch contractors. If you’re looking for a deck patio combo, we can do both! Website Design and SEO by Apollo Marketing - Proudly helping small businesses grow.